Ghana’s financial system underwent rapid growth and major transformation over the last two decades, which brought new opportunities and risks. Government implemented reforms to enhance the financial system’s resilience to shocks and its contribution to economic growth. The reforms were also aimed at strengthening the regulatory and supervisory framework and financial infrastructures. Despite these reforms, financial stability risks have heightened considerably in the last few years, with high nonperforming loans, under-capitalization, supervision and regulatory weaknesses, and governance lapses. As a result, the country’s financial sector is in crisis, with most Ghanaians feeling the crunch and the sector’s contribution to the national economy declining very fast. Some of the banks have become insolvent, with their liabilities far outweighing their assets and putting them in positions where they cannot meet their liquidity demands. According to the Bank of Ghana, the financial sector distress is characterized by severely impaired capital, inability of some banks to meet the regulatory requirement, low asset quality and a liquidity crisis. The crisis culminated in threats to depositors’ funds, thus eroding public confidence and undermining efforts to promote financial inclusion. The problems of financial sector also affected the microfinance institutions, where 272 (representing 38.5%) of the 707 institutions were distressed or folded up, leaving over GH¢740 million of depositors’ funds unsecured. This, and the collapse of seven indigenous banks since August 2017, has led to panic withdrawals of deposits from the financial institutions. Some banks and many microfinance companies remain in the news as they struggle to meet daily withdrawals. Not only have these risks and the consequent collapse of a number of microfinance institutions and banks generated debate about the health of the financial sector in the country, but also the sector’s ability to support general economic activity has been cast in doubt as investors are selling off assets with the expectation that the value of these assets will drop if they remain with the financial institutions. The insurance industry, like the financial sector, also faces a number of challenges that work to undermine the industry’s growth and its contribution to the country’s development. Mistrust and negative perceptions of the industry caused by exceptions in policy offerings, lack of transparency and agency issues, and lapses in the claim settlement process abound in the industry. Presently, less than three million Ghanaians have insurance covering their lives and properties, presenting an immense opportunity for insurance companies to widen their distribution channels and entice more people and businesses to purchase insurance policies. the beginning of 2017 (see Figure 1). As the figures show, the financial and insurance sector has been recording negative quarter-on-quarter and year-on-year real growth since the beginning of 2017, with the decline reaching 18% and 25.5% in Q3 of 2017, respectively. 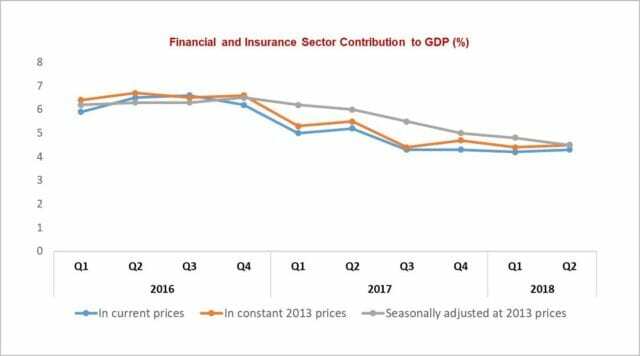 Consequently, the sector’s contribution to GDP in current prices dropped from 6.3% in 2016 to 4.7% in 2017, and then to 4.3% in Q2 of 2018 (see Figure 2). Viewed in current prices, constant 2013 prices or seasonally adjusted prices, the contribution of the financial and insurance sector to the country’s GDP shows a continuous sharp drop since the beginning of 2017, pointing to the distress the financial sector is currently going through and the low level of insurance penetration in the country. Last year, Moody’s Investors Service warned of difficult times for banks in the country in 2018, following their decreased revenues in the past two years. The rating agency also predicted that the operating revenues of the banks will continue to decline as a result of muted growth, straining their profitability and efficiency ratios. The shrinking of the size of the financial and insurance sector also has serious implications for employment. This development is expected to lead to massive direct job losses in the sector, especially for employees of the microfinance institutions and banks that have collapsed. 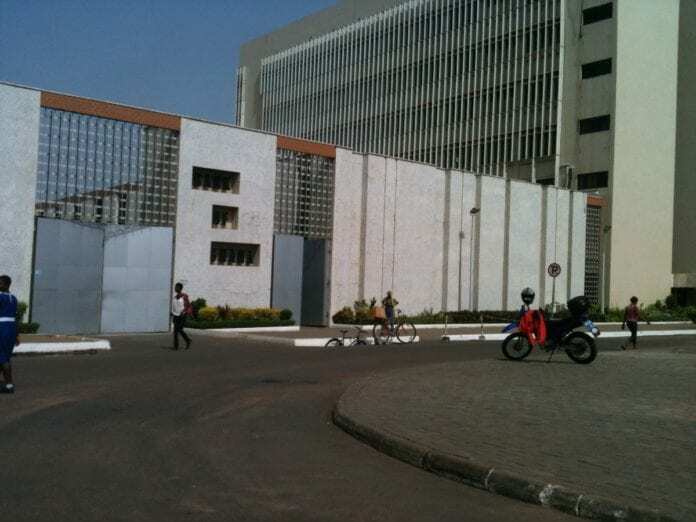 Already, a number of staff of the Consolidated Bank Ghana Limited have been put on 6-month probationary contracts of employment to allow the bank to determine its business needs and take action to rationalize staff count as would be required to fit the bank’s operating model. It is believed that the exercise will lead to over 40% of the staff losing their jobs. Also in April 2018, Bank of Ghana issued a GH¢2.2 billion bond to cover the funding gap arising from the Purchase and Assumption of UT Bank and Capital Bank Limited. On August 1, 2018, the Ministry of Finance issued a press statement indicating the issuance of a bond in the amount of GH¢5.76 billion by the government towards the Purchase and Assumption Agreement under which the Consolidated Bank Ghana (CBG) Limited (a newly incorporated government-owned bank) acquired all deposits and other specified liabilities, and good assets of five defunct banks. This was in addition to a GH¢450 million capitalization of the CBG limited. This brings to a total of GH¢6.21 billion, an amount raised by the government to deal with the exposures related to the defunct banks. These funds are definitely going to be a drain on the coffers of the government, and by implication on Ghanaian taxpayers. Not only that, but also the fragility of the banking system prevents efficient channeling of funds to profitable investment projects, reducing economic growth and increasing unemployment rates. The Governor of the Central Bank has debunked the claim that the financial sector is in crisis. According to him, the banking sector is fairly stable and the overwhelming majority of banks are operating and functioning normally despite recent developments. Local indigenous banks that are having problems are those perceived to be badly managed with major corporate governance issues. The fact of the matter, however, is that the public has already lost trust in the financial institutions and panic withdrawals have ensued whether the Bank of Ghana admits it or not. In addition, a number of banks had by end-September 2018 not indicated their ability to meet the new GH¢400 million capital requirement and they are also not showing any convincing signs of that happening. As a result, many customers are worried about the ability of their banks to meet the requirement and this has created serious uncertainties about job security for many bank employees and also reinforced the panic withdrawals. insurance products and services, low technology, false claims and delays in payment of claims, low capitalization, poor risk management and weak governance, and low public confidence and perception of the industry as the main challenges confronting the industry. Although several steps have been taken to address some of the constraints and risks facing the financial institutions, a lot remains to be done to restore safety, soundness, and stability in the financial and insurance sector. For the banking sector, the end of December 2018 will be historic as it will mark the deadline for compliance with the GH¢400 million new minimum capital requirement. Although the basis for setting the new minimum capital requirement at GH¢400 million for all banks, irrespective of their origin (indigenous or foreign), ages, sizes, etc., is unknown, the efforts of the Bank of Ghana in this direction should be supported by all, devoid of any political affiliation. The Bank of Ghana must take control of the process and be independent of political interference. For the insurance industry, and as has been clearly noted by the Managing Director of State Insurance Company (SIC) Ltd, in the absence of adequate and self-sustaining financial capacity, no insurance company will be able to fulfil its mission for being in business and to motivate its human resource base. Of particular interest to an insurance company is its ability to manage its expenditure (claims and management expenses). Building financial capacity involves growing premium income, taking concrete steps to reduce cash flow-out, having an investment regime that seeks to put funds in a solid financial system with a solid regulatory regime, and ensuring effective leadership. In conclusion, it needs to be emphasized that Ghana’s financial and insurance sector can contribute immensely to the economic development agenda of the country. But this cannot be achieved if financial institutions and insurance companies in the country operate without understanding the nature and characteristics of the economy. Banking in Ghana cannot evolve around debits and credits, salary loans, consumer loans and still expect to have a wider and deeper financial sector. Financial institutions must commit resources and time to develop appropriate and innovative products to meet the demands of the economy and to target economically active clients outside the formal sector. To this end, the Governor of the Bank of Ghana and the Minister of Finance need to pay greater attention to economic reforms and macro policies that stimulate higher and inclusive economic growth. Since the major risk to the banking sector is the high level of non-performing loans, Bank of Ghana must take regulatory actions to restructure weak banks to improve transparency and reduce risks to financial stability. Banks should be required to put in place measures to strengthen credit management and risk processes, and improve loan recovery efforts. Insurance companies must work to widen their distribution channels by forging partnerships with the financial institutions and telecommunication companies to reach the neglected and unbanked population. There is also the need to build long-term relationships of trust with clients by simplifying the product structure, and properly disclosing all caveats or exclusions to insurance contracts before final agreements are concluded with clients. Next articleWhich African Football Giant Grabs The World Cup Ticket?